The Professional Regulation Commission (PRC) on Wednesday, November 27, 2013 released results of November 2013 Civil Engineering board exam. 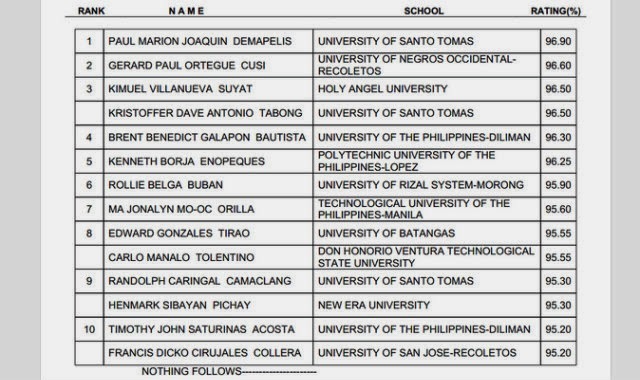 Paul Marion Joaquin Demapelis of University of Santo Tomas (UST) topped the board with 96.90 percent average grade. Gerard Paul Cusi of University of Negros Occidental-Recoletos who got a score of 96.6% placed second. Tied on third place are graduates of Holy Angel University and University of Santo Tomas.